Hard-running front rower James Gavet is set to make a shock departure from the Warriors to join Newcastle on a two-year deal. The Herald understands the Warriors have released Gavet from the final year of his contract, with the paperwork expected to be finalised today. The 29-year-old is believed to be heading to the Knights on a two-year contract. News of his exit comes after Gavet made a cryptic social media post today suggesting his time at the Warriors was over. "Thanks for the ride fam OUTTA-HERE !!! DONE & DONE," read Gavet's story on Instagram. Gavet's release comes after disciplinary issues contributed to him being dropped from the Warriors side for their final round 20-16 win over Canberra on August 25. It's understood Gavet was late to training and a couple of other club functions in the lead-up to retiring forward Simon Mannering's 300th NRL game and last home appearance at Mt Smart Stadium. 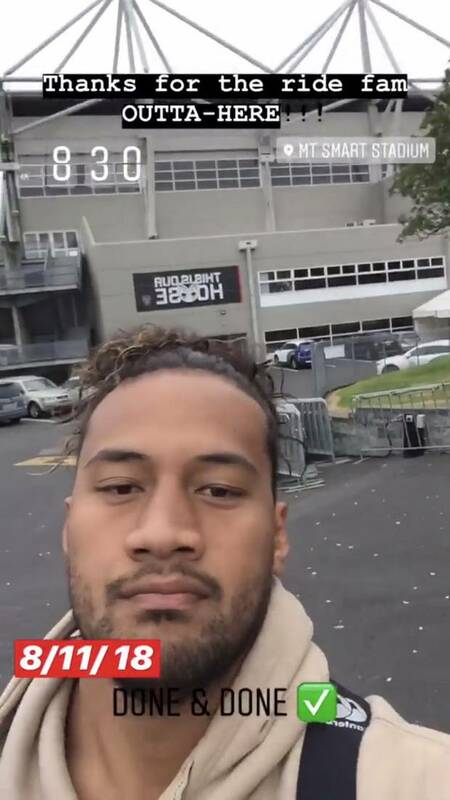 Gavet returned to the starting side for the Warriors' season-ending qualifying final loss to Penrith at ANZ Stadium in week one of the playoffs. The Samoan international joined the Warriors in 2016 after stints at the Bulldogs, Wests Tigers and Broncos. Gavet played 42 matches throughout his time at the Auckland-based club and made 19 appearances for the Warriors last season.